If your daily commute forces you to waste precious hours stuck in traffic or to elbow your way into overcrowded public transit vehicles, you probably need little convincing about the importance of good quality, reliable transport. Now, imagine your frustration if, instead of simply dealing with less-than-perfect transport, you had to make do with no transport at all. For many persons with disabilities, this is not just fiction, but a daily struggle that is all too real: a large proportion of urban and inter-urban transport systems remain either completely off-limits or incredibly difficult to use for passengers with disabilities, turning even the shortest trip into a logistical nightmare. Mobility constraints are a major obstacle to disability-inclusive development, as they exacerbate the economic, social, and personal isolation of persons with disabilities, and tend to push them further into poverty. Lending operations: transport is the World Bank’s largest sector in terms of overall lending (21% of the institution’s active portfolio), and is also one of the most active when it comes to disability inclusion. The Bank’s experts have been working hand in hand with client countries to integrate the principles of “universal design” into transport projects, especially physical upgrades such as access ramps, elevators, tactile surfaces on platforms, braille signage, low-floor vehicles, audio and visual announcements, etc. Analytical work: in partnership with the World Health Organization (WHO), the Word Bank released the first-ever World Report on Disability, and will soon be launching a new flagship study on mental health, an issue that is often overlooked in the global conversation about disability. In the transport sector, our experts have developed an extensive knowledge base to help stakeholders understand the technical aspects of universally accessible transport. With the demand for transport infrastructure and services at an all-time high, now is the time to make sure that accessible transport becomes the rule rather than the exception. The legislation has evolved as well. The 2006 United Nations Convention on the Rights of Persons with Disabilities, in particular, provides that: “States Parties shall take appropriate measures to ensure to persons with disabilities access, on an equal basis with others, […] to transport” (art. 9). 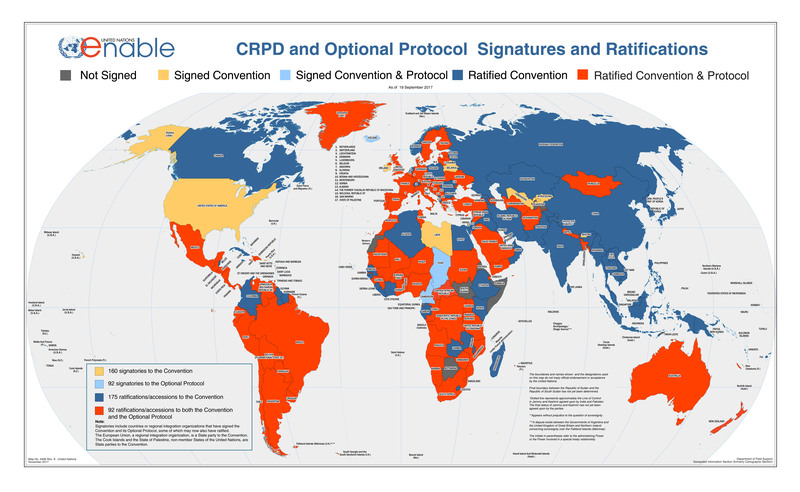 The Convention has been ratified by and is legally binding in 160 countries. At the national level, countries across regions and income groups have passed legislation to protect the rights of persons with disabilities. Of course, challenges remain; chief among them is the lack of reliable, disaggregated data on disability and disability-inclusive transport. “Without statistical evidence, it is much harder to drive policy change and to measure the impact of accessible transport projects,” noted Charlotte McClain-Nhlapo. “Hopefully, the 7 Sustainable Development Goals (SDGs) that include disability will create an impetus for more and better data, as progress toward each of the SDGs will have to be clearly measured,” she added. Concerns about cost are another persistent hurdle. However, experts agree that the incremental cost of providing universal access is usually minimal in new or “greenfield” projects, whereas retrofitting existing systems comes with a much heftier price tag. “That is why accessibility should be factored into projects right from the start; for older systems that can’t be retrofitted, we need to find creative and realistic alternatives,” said Charlotte McClain-Nhlapo. “When considering the cost of accessibility, you also need to keep in mind that universal design does not just improve the mobility of persons with disabilities, but brings co-benefits to many others: you have to think about the elderly, parents pushing strollers, and all those who may be dealing with temporary physical impairments,” she added. Involving Civil Society Organizations (CSOs) has been instrumental in securing buy-in from local authorities, for governments tend to pay closer attention to grievances coming from their own constituents (read about Liaoning Medium Cities Infrastructure Project for an interesting example from China). In addition, working with CSOs helps ensure that new projects truly meet the needs of persons with disabilities: when it comes to making transport universally accessible, the devil is most definitely in the detail, and a simple oversight or minor construction flaw can render a whole system unusable. Input from local associations of persons with disabilities is critical to making sure that transport systems designed to be accessible have been “used and approved” by those who need them most.